Cherner, T. & Curry, K. (2017). Enhancement or Transformation? A Case Study of Preservice Teachers’ Use of Instructional Technology. Contemporary Issues in Technology and Teacher Education, 17 (2), 268-290. Waynesville, NC USA: Society for Information Technology & Teacher Education. Retrieved April 26, 2019 from https://www.learntechlib.org/primary/p/173575/. Abbitt, J.T. (2011). An investigation of the relationship between self-efficacy beliefs about technology integration and Technological Pedagogical Content Knowledge (TPACK) among preservice teachers. Journal of Digital Learning in Teacher Education, 27(4), 134142. Anderson, S.E., Groulx, J.G., & Maninger, R.M. (2011). Relationships among preservice teachers' technology-related abilities, beliefs, and intentions to use technology in their future classrooms. Journal of Educational Computing Research, 45(3), 321-338. Cherner, T., Dix, J., & Lee, C. (2014). Cleaning up that mess: A framework for classifying educational apps. Contemporary Issues in Technology and Teacher Education, 14(2), 158193. Cherner, T., & Curry, K. (2016). Changing times: Preparing preservice social studies teachers to teach disciplinary literacy skills. Mid-South Literacy Journal, 1(2), 2-34. Cutcliffe, J.R., & McKenna, H.P. (1999). Establishing the credibility of qualitative research findings: the plot thickens. Journal of advanced nursing, 30(2), 374-380. Ditzler, C., Hong, E., & Strudler, N. (2016). How tablets are utilized in the classroom. Journal of Research on Technology in Education, 48(3), 181-193. Gökçearslan, Ş., Karademir, T., & Korucu, A.T. (2016). Preservice Teachers’ Level of Web Pedagogical Content Knowledge Assessment by Individual Innovativeness. Journal of Educational Computing Research, 0735633116642593. Gökçe, S., Yenmez, A.A., & Özpınar, İ. (2016). Mathematics Teachers’ Opinions on Worksheets Prepared with GeoGebra. Turkish Journal of Computer and Mathematics Education (TURCOMAT), 7(1), 164-187. Gerring, J. (2004). What is a case study and what is it good for?. American Political Science Review, 98(2), 341-354. Green, L.S., Chassereau, K., Kennedy, K., & Schriver, M. (2013). Where technology and science collide: a co-teaching experience between middle grades science methods and instructional technology faculty. Journal of Technology and Teacher Education, 21(4), 385-408. Gursui, F., & Tozmaz, G.B. (2010). Which one is smarter? Teacher or board. Innovation and Creativity in Education, 2(2), P. 5731-5737. Hamilton, E.R., Rosenberg, J.M., & Akcaoglu, M. (2016). The Substitution Augmentation Modification Redefinition (SAMR) Model: a Critical Review and Suggestions for its Use. TechTrends, 1-9. Hammond, M., Crosson, S., Fragkouli, E., Ingram, J., Johnston‐Wilder, P., Johnston‐Wilder, S., Kingston, Y., Pope, M., & Wray, D. (2009). Why do some student teachers make very good use of ICT? An exploratory case study. Technology, Pedagogy and Education, 18(1), 59-73. Hanson, J.L., Balmer, D.F., & Giardino, A.P. (2011). Qualitative research methods for medical educators. Academic Pediatrics, 11(5), 375-386. Hilton, J.T. (2016). A case study of the application of SAMR and TPACK for reflection on technology integration into two social studies classrooms. The Social Studies, 107(2), 6873. Hofer, M. & Grandgenett, N. (2012). TPACK development in teacher education: A longitudinal study of preservice teachers in a secondary M.A.Ed. Program. Journal of Research on Technology in Education, 45(1), 83-106. Hughes, J.E., Liu, S., & Lim, M. (2016). Technological modeling: Faculty use of technologies in preservice teacher education from 2004 to 2012. 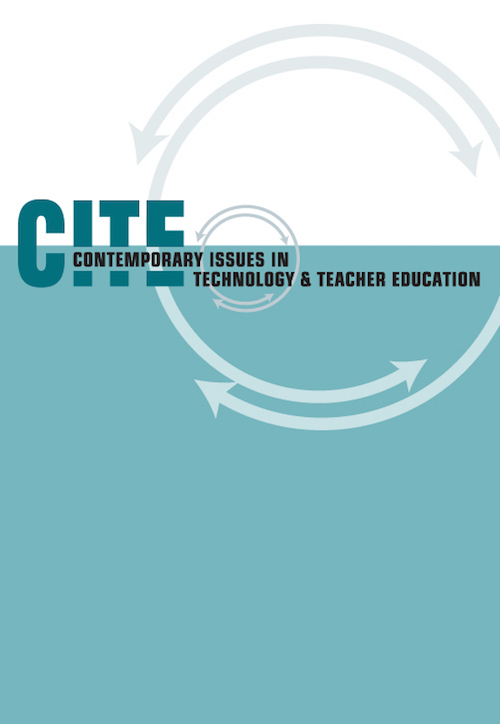 Contemporary Issues in Technology& Teacher Education, 16(2), 184-207. Keengwe, J. (2015). Promoting active learning through the integration of mobile and ubiquitous technologies. Hershey, PA: Information Science Reference. Koc, M., & Bakir, N. (2010). A needs assessment survey to investigate preservice teachers’ knowledge, experiences and perceptions about preparation to using educational technologies. The Turkish Online Journal of Educational Technology, 9(1), 13-22. Kouwenhoven, W. (2009). Competence-based curriculum development in higher education: A globalised concept? In A. Lazinca & C. Calafate (Eds. ), Technology education and development (pp. 1–22). Kluckhohn, F.R. (1940). The participant-observer communities. American Journal of Sociology, 331-343. Martin, F., & Ertzberger, J. (2013). Here and now mobile learning: An experimental study on the use of mobile technology. Computers& Education, 68, 76-85. McKnight, K., O’Malley, K., Ruzic, R., Franey, J., Horsely, M.K., & Bassett, K. (2016). Teaching in a digital age: How educators use technology to improve student learning. Journal of Research on Technology in Education, 48(3), 194-211. Mishra, P., & Koehler, M.J. (2008, March). Introducing technological pedagogical content knowledge. In annual meeting of the American Educational Research Association (pp. 116). Mishra, P., & Koehler, M. (2009). Too Cool for School? No Way! Using the TPACK Framework: You Can Have Your Hot Tools and Teach with Them, Too. Learning& Leading with Technology, 36(7), 14-18. Nathan, M.J., & Knuth, E.J. (2003). A study of whole classroom mathematical discourse and teacher change. Cognition and Instruction, 21(2), 175-207. Pamuk, S. (2012). Understanding preservice teachers’ technology use through TPACK framework. Journal of Computer Assisted Learning, 28(5), 425-439. Patton, M.Q. (2005). Qualitative research. Hoboken, NH: John Wiley& Sons, Ltd.
Preseton, C., & Mowbray, L. (2008). Use of SMARTboards for teaching, learning, and assessment in kindergarten science. Teaching Science, 54(2), P. 50-53. Richards, J. & Stebbins, L. (2014). 2014 U.S. Educational technology market: PreK-12. Washington, D.C.: Software& Information Industry Association. Sadaf, A., Newby, T.J., & Ertmer, P.A. (2012). Exploring preservice teachers' beliefs about using Web 2.0 technologies in K-12 classroom. Computers& Education, 59(3), 937-945. Tuttle, H. (2012). The lived experiences of faculty who use instructional technology: A phenomenological study. (Unpublished doctoral dissertation). University of Nebraska– Lincoln, Lincoln, NE. Vu, P., McIntyre, J., & Cepero, J. (2014). Teachers' Use of the iPad in Classrooms and Their Attitudes toward Using It. Journal of Global Literacies, Technologies, and Emerging Pedagogies, 2(2), 58-74. Wakefield, J., & Smith, D. (2012). From Socrates to satellites: iPad learning in an undergraduate course. Creative Education, 3(05), 643. Williams, N.L. & Larwin, K.H. (2016). One-to-one computing and student achievement in Ohio high schools. Journal of Research on Technology in Education, 48(3), 143-158.